I have to say, Iâ€™m really enjoying Apple Music this second time around. I find its UI much faster to use overall. What used to feel like navigating a labyrinth of music now just feels like managing a library of music â€” which is as it should be. Iâ€™ve been using Apple Music for the past month or two, and I think Iâ€™ll stick with the service for the foreseeable future. One of the major reasons I liked Spotify so much was that it made it fun and easy to discover new music, but now that Apple Music shows related music under each song, I find myself adding several tracks per week to my library. Iâ€™ve also set both my iPhone and iPad to automatically download any new songs added to my library, so it really does feel seamless when I get home. I can put down the iPhone and start playing those new tracks from the iPad, without even having to stream anything (since the songs were already downloaded to the device in the background). The large, punchy text and album art are a good thing overall. The buttons are very easy to hit on the iPhone 6S Plus, and I have always loved seeing my library as a collection of gorgeous album art. The only downside is that thereâ€™s no way to view recently added songs in a simple list: the Recently Added view only shows music as giant albums, which you have to tap on in order to view. If you add a lot of music to your library (which Iâ€™m starting to do), this UI may not scale very well, and an option to view recently added songs as list items would be very helpful. Itâ€™s changes like that this that make the iOS 10 Music app feel a lot more fluid and modern. The Now Playing screen has been changed to accommodate a vertical format. The album artwork and playback controls will fill the screen at first, but as you start to scroll down, youâ€™ll see Lyrics and your Play Next list (filled with upcoming songs). There are two things that are confusing about this: unless you know about the setup or are used to tinkering with touch interfaces, you may not even realize that you can scroll down past the Now Playing screen. The other confusing element is that the Repeat + Shuffle buttons, which are very important playback controls, are located under the Lyrics sub-section. I think this is a miss for the interface, and those playback controls should be right on the very top of the Now Playing screen. Another curious change is the absence of any star ratings: theyâ€™re just gone. I was hoping they would come back at some point during the beta, but as of iOS 10.0.1, you can either Love a song or Dislike itâ€¦there are no more star ratings from 1 through 5. I thought Iâ€™d miss these ratings more, but Iâ€™ve been doing fine without them. The funny thing is that theyâ€™re still on the Mac, so we might see them return to iOS in a future update. 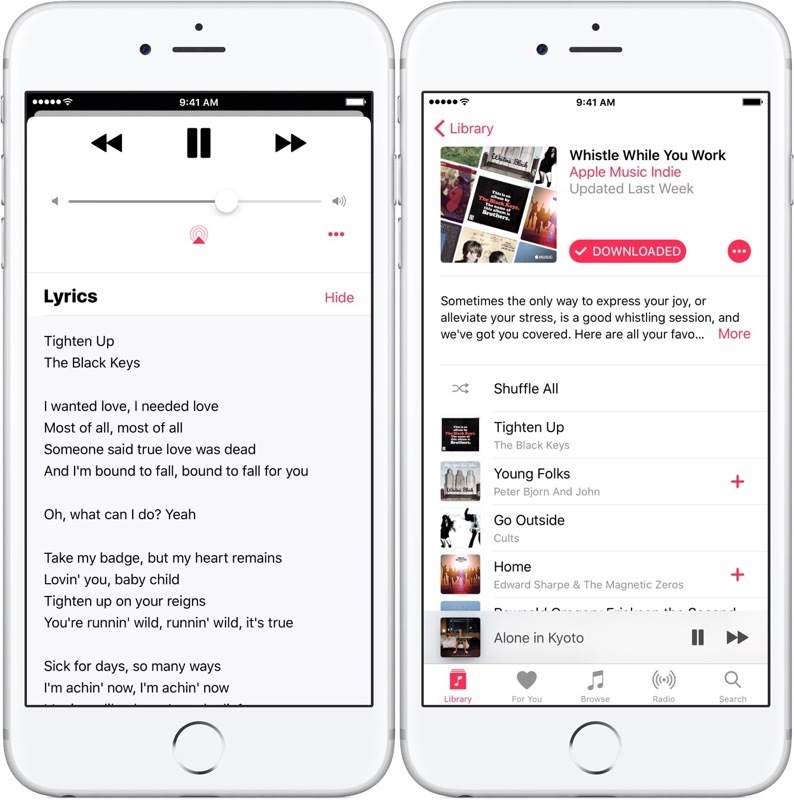 I wrote about this earlier on in the summer, but Apple Music is taking peopleâ€™s music libraries more seriously. The service used to just match your music purely based on metadata, which could result in the service replacing album recordings with the live concert versions of those same songs. This was very annoying, and ironically punishing to customers who wanted to use the service. The good news is that Apple seems to have addressed this, at least on my account. I donâ€™t remember any experience in the last two months where Iâ€™ve tapped on a song and heard sounds that I was not expecting. In a tech world where weâ€™re seeing an increasing number of services ask us for monthly subscriptions, Iâ€™ve really started to question what kind of things I really want to pay for each month. Music is still very high on that list, and having played with both Spotify and Apple Music this year, Iâ€™m happy to stay with Appleâ€™s service for the time being. Itâ€™s not as good a cross-platform experience as Spotify is, but itâ€™s hard to beat Apple Musicâ€™s first-party integration. I can play songs from Spotlight, start them from Siri, or have new music automatically download in the background. Now that the service is actually navigable with iOS 10, Iâ€™m once again a happy Apple Music customer.